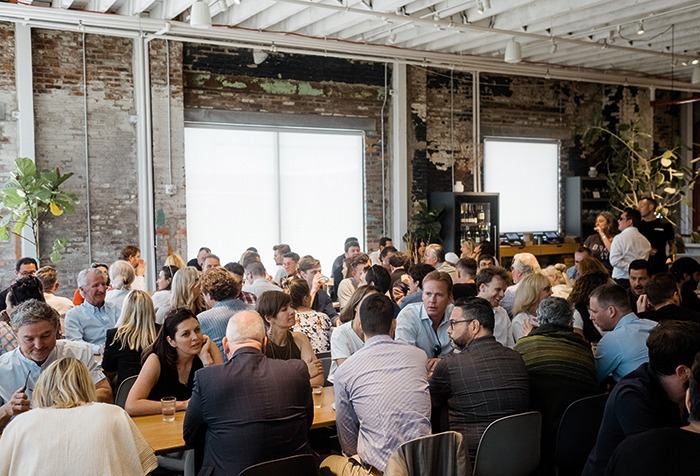 The seventh edition in the inventive series of events for innovators returned to the Americas for a programme of industrial architecture, regeneration and craft. Built as a farming village by the Dutch in the early 1600s, Breucklen – as it was then known – has endured a turbulent and storied history, redefining itself time after time. Today, Brooklyn is a melting pot of ideas, creativity and innovation. Above all, its diverse culture is driven by a DIY attitude, leading to Sleepover 2018’s overarching theme of ‘Make it Happen’. In recent years, as Brooklyn’s creative communities have begun to disperse to Bushwick, Bed-Stuy and beyond, Williamsburg and neighbouring DUMBO have become hotspots for new models of real estate development. Boutique hotels and luxury condos sit side-by-side with start-up labs, co-working spaces, workshops, urban farms and craft breweries. 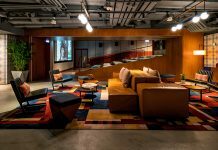 Sleepover Brooklyn attendees were hosted at the area’s namesake property, The Williamsburg Hotel, completed in 2016 by developers Heritage Equity Partners and London-based design practice Michaelis Boyd. 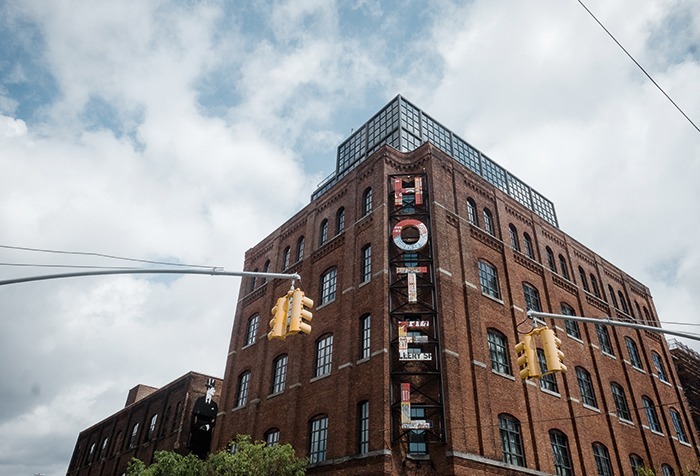 Located on the former scrapyard stretch of Wythe Avenue that is now a hub of the borough’s north, its redbrick highrise neighbours include Wythe Hotel, The William Vale and Brooklyn Bowl. Welcoming attendees to registration and lunch, Sleeper’s Editor-in-Chief Matt Turner spoke of the area’s significance, as well as the intense regeneration of past years: “The first time I came here, I remember thinking, ‘wouldn’t Brooklyn just be the coolest place to do our next event?’ But there just wasn’t a hotel here that could fit us all in. We have this phrase in the UK about waiting for a bus, where you wait ages for one, then three turn up at once. And here we are, with The Williamsburg, The William Vale and 1 Hotel.” In naming those properties, Turner both gave a nod to surrounding projects and listed the programme ahead. Following lunch, attendees split into three groups for behind-the-scenes tours of surrounding properties. Led by each project’s architects and designers, tours offered a unique, in-depth and personal insight into the ideas, processes and challenges faced. Leading the host hotel tour, Alex Michaelis, Founding Partner, Michaelis Boyd Associates, discussed the studio’s thinking behind the brick-clad façade accented with glass and Corten steel that allows seamless assimilation with its industrial surroundings. Inside, guestrooms feature double-height ceilings, reclaimed oak parquet flooring and Art Deco bathroom fixtures. Guests were then taken to the soon-to-be completed rooftop with its stunning water tower feature typical of the area. Meanwhile, around the corner, Alessandro Munge of Toronto-based Studio Munge and Nick Liberis of Albo Liberis offered attendees a look at The William Vale. The most recent Williamsburg opening – soon to be joined by The Hoxton – features an abundance of artwork, including a dominating commissioned piece by Brooklyn artist Marela Zacarias that occupies the lobby. 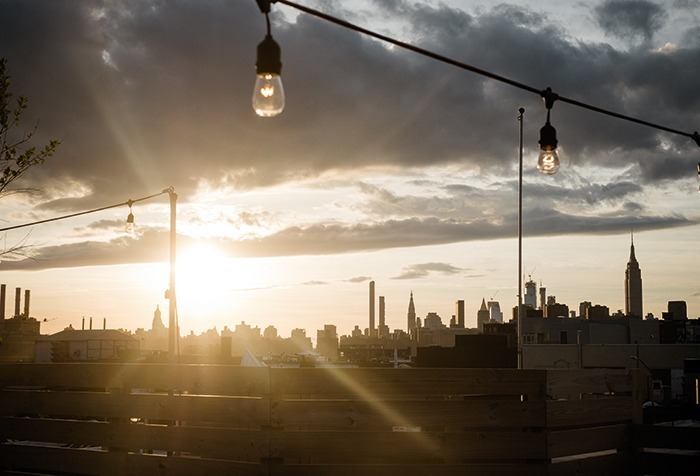 Billed as its crowning glory, the hotel also features local hangout spot Westlight, a rooftop bar with views spanning the Manhattan skyline. Down in DUMBO, the tour of 1 Hotel Brooklyn Bridge captured imaginations as Marvel Architects and I.N.C. Architecture & Design gave a private tour through the brand’s first newbuild property. 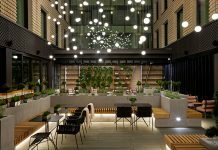 As with its sister hotels, eco-consciousness is paramount throughout the project, from harvesting rainwater to upcycled furniture to partnering with progressive, sustainability-focused organisations. Following a long day of tours, ideas and socialising, attendees gathered for sunset drinks at Dobbin St rooftop, a unique space within a transformed factory. 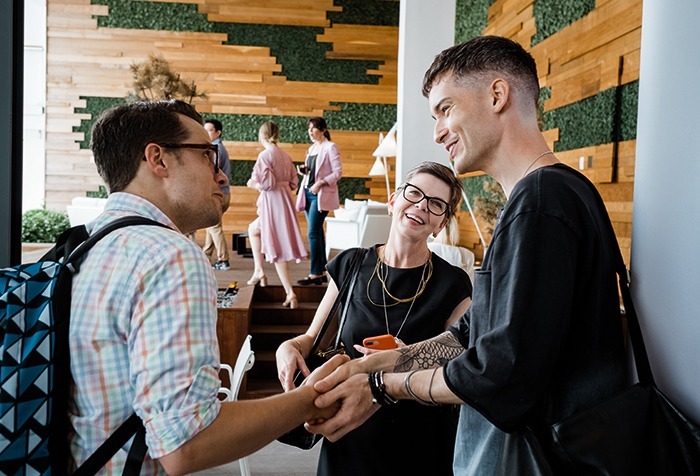 Nestled on the border of Greenpoint and Williamsburg, the industrial-inspired venue boasts skyline views and design by New York-based flower powerhouse Fox Fodder Farm. 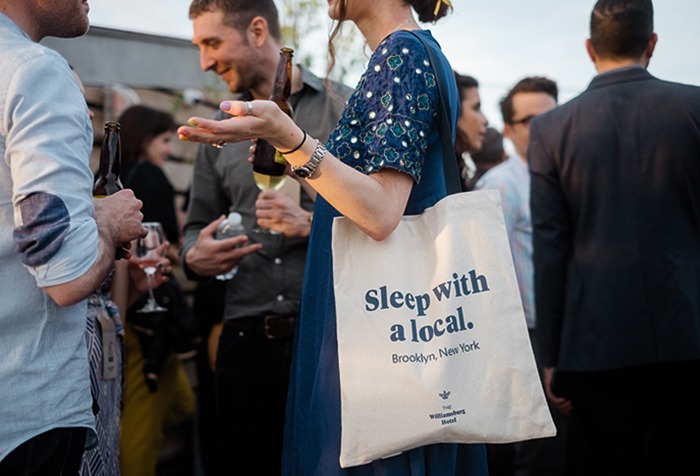 After many photo opportunities and a chance to network with hand-selected local guests, attendees headed back to where it all began, Wythe Hotel, for dinner, communal style. 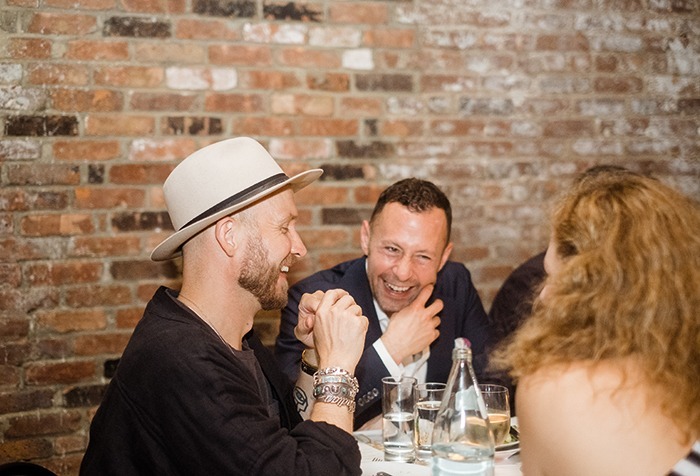 The meal allowed ample opportunity to discuss the day’s events with friends old and new, while Principal Owner Peter Lawrence spoke of Wythe’s significance in the regeneration of north Williamsburg. Day two started with Further, an immersive experience in collaboration with Design Hotels. Following a wholesome breakfast, attendees gathered in The Williamsburg’s subterranean ballroom as local LGBTQ+ champions and performers House of Yes ushered participants to a floor seat. Encouraged to remove footwear and disconnect from the cyber sphere, the result was a truly connected, engaging affair. Opening the ceremony, multi-instrumentalist Nacho Arimany and DJ Carlita set the tone, before Markus Schreyer, Vice President, The Americas, Design Hotels, introduced the concept and aims of Further. Proceedings then moved to an insightful conversation around the theme of transformation, chaired by Ben Pundole, Vice President of Brand Experience at Edition Hotels and Founder / Editor-in-chief of A Hotel Life. The informal panel talk included local and international visionaries including: Claus Meyer, culinary entrepreneur; Anya Sapozhnikova and Kae Burke, co-founders, House of Yes; and Zach Bell, Manager of Community Impact at Habitas. 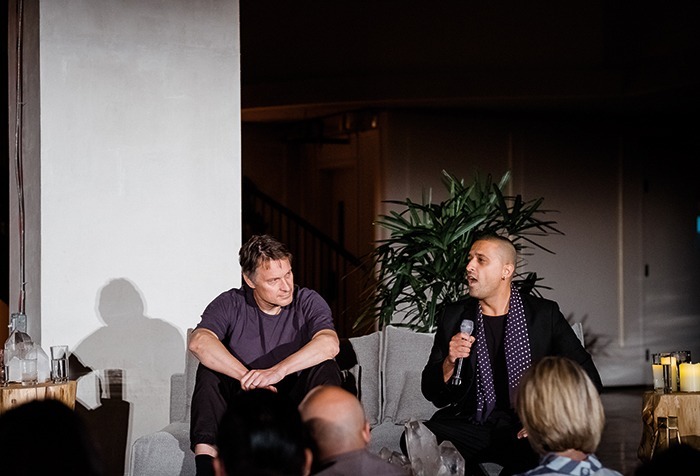 The illuminating discussion explored community transformation, the importance of inclusion in an age where hate and fear fills the media, and the future of sustainability from both a primitive and broad perspective. 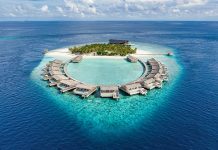 In closing, Pundole highlighted A Hotel Life’s Stay Plastic Free initiative, urging attendees to be proactive in fighting the global environmental issue. Following the talk – and an unprompted group conversation – attendees earned some time to relax as they strolled the sun-drenched streets to lunch spot Norman. 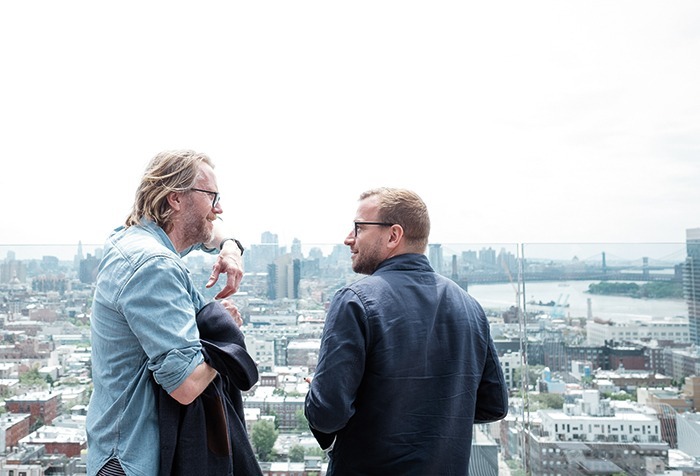 Co-founded by the morning’s speaker Claus Meyer, the venue is housed within creative space A/D/O, offering all-day dining to Brooklyn’s diverse community. Led by chef Stephan Ilnyckyj, the communal lunch included fresh plates created using seasonal ingredients based on sustainable relationships with local suppliers and farmers. After boarding re-purposed school buses, attendees travelled to Industry City, a vast expanse of industrial architecture on the waterfront home to creative brands, craftspeople and innovative businesses. Here, a number of local makers offered workshop visits, giving insight into other industries and chance to talk one-on-one with some of the most exciting artists in Brooklyn. 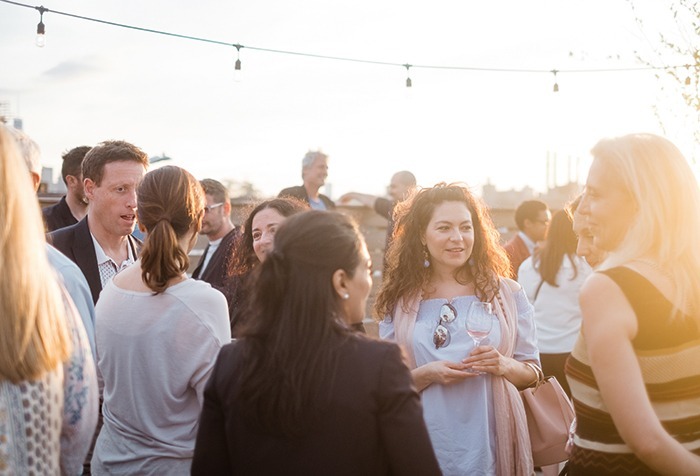 After exploring the six million ft2 site – developed by Belvedere Capital and Jamestown – the final stop was another round of sunset drinks, with views spanning nearby dockyards and the Statue of Liberty. Following an intense two-day programme, the closing party was hosted at the famous Brooklyn Bowl where friendships solidified over pitchers of local beer, finger food and competitive bowling tournaments. Hosted by local duo Adventure[s], the pop-theme party ended with a DJ set from international popstar Robyn – closing Sleepover, Brooklyn style. Sleeper would like to thank the following for their support of Sleepover Brooklyn: Bellino Fine Linens, Gira, Grohe, Ice International, Kaldewei, Kalisher, Lasvit, Laufen, Leds-C4, RH Contract, Robena Contract Furnishings, Shaw Hospitality, Carnegie, Shademaker, Viriato Hotel Concept, and West Elm Contract. Full photography as well as a video of the event, shot by BlackAnt Media, can be viewed here.